Brighten up a bland wall with plants in the Gardman Forge Wall Trough with Coco Liner. This planter is perfect for gardeners who have more plants than planting room. The long trough offers room for several flowers or herbs, and the flat back makes it perfect for mounting under a window. Five notches along the back frame allow the trough to securely connect to your wall with heavy duty screws. 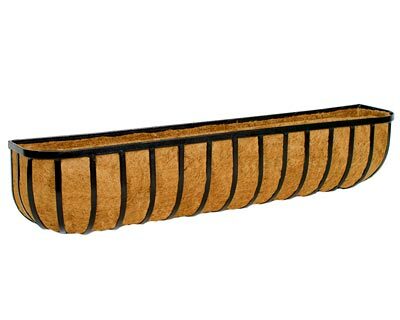 The included coco liner provides a cozy bed for your plants and keeps soil from spilling out of the trough. The durable steel frame is coated in black rust-resistant PVC for years of use. Add planting room to your outdoor wall with the Forge Wall Trough with Coco Liner.